Description: The only VGN steam left. No diesel survived. Two E33s survived of all the electrics. Description: The last VGN steam. Description: The only surviving steam engine from the Virginian Railway! One of 2 Class SAs built by Baldwin between 1909-1910 for the railway. Description: In 1957, it was retired and donated to the city of Princeton, West Virginia. Unfortunately, vandals got to it in front of the courthouse, where it was displayed. Thankfully, the Norfolk & Western traded a caboose for it 3 years later and fixed up the engine at their shops before donating it to the museum, where it is still preserved today! Description: Great view of the 1926 Alco built 0-8-0 switcher #12 and still showing its fine details. 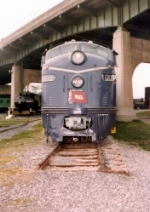 Luckily, this loco was saved from the scrap line and was donated to the Museum of Transportation in 1948. Doesn't look as sharp as it does in this photo though. Robert Graham photo credit. Description: For a locomotive that is so highly praised on the museum's website, she needs quite a bit of work. Description: Alton & Southern 12 at Museum o Transportation in St Louis, Mo. Description: Alton & Southern 12 at Museum of Transportation in St Louis, Mo.